Give the gift of gluten free bread. That might sound odd, but for a coeliac the idea of having proper toast or a sandwich that doesn’t taste of cardboard is quite an exciting prospect. We’ve launched a Gift Card for Black Friday and we’re offering 25% off until the 28th of November. 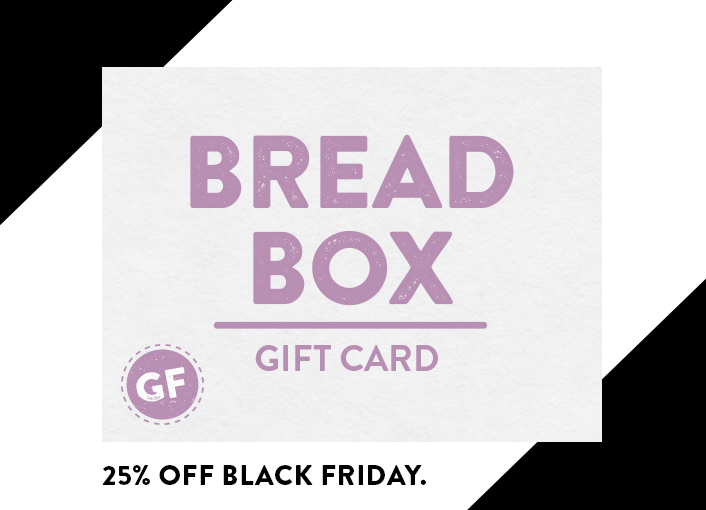 The recipient of this gift card simply enters a code in our online shop to redeem their Gluten Free Bread Box containing 3 All White and 3 Superseed loaves. The price of the gift card includes delivery of the Bread Box. Once purchased, we will email you (the purchaser) the gift card and code to print for the recipient, along with instructions on how to redeem the Bread Box. To get 25% off the price of the gift card for a limited time, simply enter the discount code tistheseason when checking out.